With the brand new Media Session API, you can now customize media notifications by providing metadata for the media your web app is playing. It also allows you to handle media related events such as seeking or track changing which may come from notifications or media keys. Excited? Try out the official Media Session samples. The Media Session API is supported in Chrome 57 (beta in February 2017, stable in March 2017). You already know about the Media Session API and are simply coming back to copy and paste with no shame some boilerplate code? So here it is. Add a simple <audio> element to your web page and assign several media sources so that the browser can choose which one works best. Note: I could have used a <video> element instead to showcase the Media Session API. 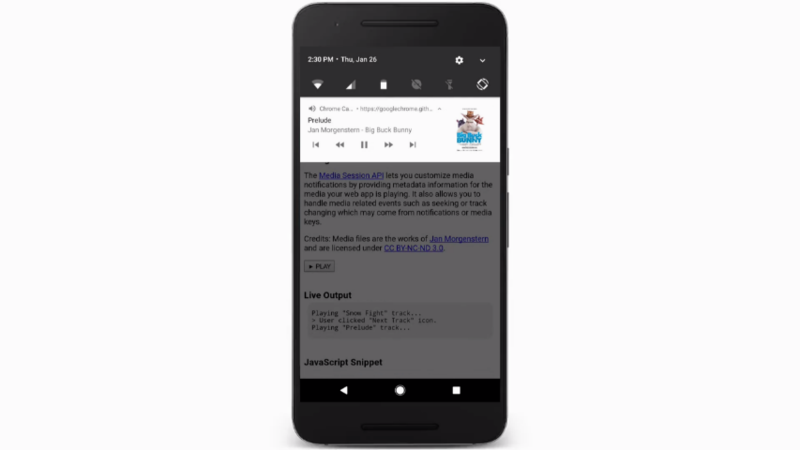 As you may know, autoplay is disabled for audio elements on Chrome for Android which means we have to use the play() method of the audio element. This method must be triggered by a user gesture such as a touch or a mouse click. That means listening to pointerup, click, and touchend events. In other words, the user must click a button before your web app can actually make noise. Note: If the <audio> element has the controls attribute, you can simply set up the media session in the audio play event listener instead which occurs when user taps the "play" audio control. If you don't want to play audio right after the first interaction, I recommend you use the load() method of the audio element. This is one way for the browser to keep track of whether the user interacted with the element. Note that it may also help smooth the playback because the content will already be loaded. When your web app is playing audio, you can already see a media notification sitting in the notification tray. On Android, Chrome does its best to show appropriate information by using the document's title and the largest icon image it can find. Note that media action handlers will persist. This is very similar to the event listener pattern except that handling an event means that the browser stops doing any default behavior and uses this as a signal that your web app supports the media action. Hence, media action controls won't be shown unless you set the proper action handler. The "Play/Pause" icon is always shown in the media notification and the related events are handled automatically by the browser. If for some reason the default behavior doesn't work out, you can still handle "Play" and "Pause" media events. // User clicked "Play" media notification icon. // User clicked "Pause" media notification icon. Note: The browser may consider that the web app is not playing media when files are seeking or loading. You can override this behavior by setting navigator.mediaSession.playbackState to "playing" or "paused". This comes in handy when you want to make sure your web app UI stays in sync with the media notification controls. I know what you're thinking now... service worker to the rescue! All media and artwork files are served with the appropriate Cache-Control HTTP header. This will allow the browser to cache and reuse previously fetched resources. See the Caching checklist. Make sure all media and artwork files are served with the Allow-Control-Allow-Origin: * HTTP header. This will allow third-party web apps to fetch and consume HTTP responses from your web server. Regarding media files, I recommend a simple "Cache, falling back to network" strategy as illustrated by Jake Archibald. // Add artwork to the cache for later use and return network response. // Return cached fallback artwork. Caution: If you want your service worker to be able to intercept artwork network requests on the very first page load, you may want to call clients.claim() within your service worker once it's activated. As the user consumes content from your web app, media and artwork files may take a lot of space on their device. It is your responsibility to show how much cache is used and give users the ability to clear it. Thankfully for us, doing so is pretty easy with the Cache API. // Use content-length HTTP header when possible. // Otherwise, use the uncompressed blob size. Chrome for Android requests "full" audio focus to show media notifications only when the media file duration is at least 5 seconds. Notification artwork support blob URLs and data URLs. If no artwork is defined and there is an icon image at a desirable size, media notifications will use it. Notification artwork size in Chrome for Android is 512x512. For low-end devices, it is 256x256. Dismiss media notifications with audio.src = ''. As the Web Audio API doesn't request Android Audio Focus for historical reasons, the only way to make it work with the Media Session API is to hook up an <audio> element as the input source to the Web Audio API. Hopefully, the proposed Web AudioFocus API will improve the situation in the near future. Media Mession calls will affect media notifications only if they come from the same frame as the media resource. See the snippet below. At the time of writing, Chrome for Android is the only platform that supports the Media Session API. More up-to-date information on browser implementation status can be found on Chrome Platform Status. Check out our official Chrome Media Session samples featuring Blender Foundation and Jan Morgenstern's work.